The whale shark (Rhincodon typus) is a slow-moving filter feeding species of shark. He is the largest known extant fish species. The whale shark holds many records for sheer size in the animal kingdom, most notably being by far the largest living non mammalian vertebrate, rivaling many of the largest dinosaurs in weight. This is the body design of whale shark. Whale shark is the biggest fish in the sea. 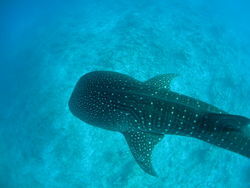 The body length of mother whale shark is usually outside 40ft (12m), and the biggest one is 60ft (18m). The weight of whale shark is 15-20tons. The body of a whale shark is thick and long, and its head is big and flat. The mouth is almost flush against the end of the snout, and we can see the trace of the beard.The size of blowhole is similar to their eye diameter, and they don't have eyelids. They have a huge gill. Inside the gill, there is a membrane which looks like sponge, and it filters the food which had come through the mouth including water. They also have almost 300 lines of teeth at both sides of their jaw, and their second dorsal is smaller than the first dorsal. It has a ridge line in front of the caudal fin. 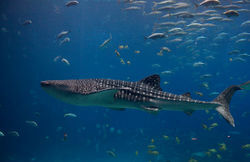 The body color of the whale shark is gray or blue and brown, and their belly is white. There is a white spot and a vertical stripe above his belly. Whale shark checking diver in Koh Phangan vicinity, Thailand. Whale shark has been estimated to live at least 100 years. They usually live in the distant sea, and sometimes appear near the coast. They live alone or live in groups. Since they grows about twenty meters long and weigh over 20 tons, They have to spend a lot of time to eat food. Whale shark has a unique way of eating. It is a filter feeder. The giant fish pushes out the jaws and filters everything in his path. The water and their contents are taken in and then discharged through the gills. Anything bigger than 2-3 cm are trapped by teeth. The teeth work as a strainer. It allows the water and very small particles to pass and be expelled through the gills. Eventually whale sharks must clean out the trapped particles in the dermal teeth. This is done by coughing. Whale shark lives in temperate, tropical regions of the ocean. Although whale shark have a giant sized body, it has the gentle property, so we can see them swimming with people side by side. He classified as endangered Species, and often found near the Jeju-island in Korea. This is the point Map of Rhincodon typus. The ecology of whale sharks isn't very completely known.Whale shark presences in Bahía de Los Angeles, Baja California Norte, Mexico, is a seasonal phenomenon, occurring during the months of June–November, with highest abundance from August to October. Whale sharks follow oceanographic cues both within the bay as well as throughout the Gulf of California that are favorable for increasing of prey resources. Since their ecotourism is rapidly increasing in Bahía de Los Angeles, it's important to manage and identify ecologically important areas used by whale sharks within the bay to insure the continued integrity of the habitat which supports whale shark existence. ↑ Brian J, Skerry.Whale shark National geographic. Web. Unknown date. ↑ 사전임. 고래상어 두상백과. Web. unknown date. ↑ Trenna Sue Hiler. Life Cycle of Whale Sharks Marine Biology. Web. Published in march 5 2012. ↑ 닉네임 LIRIKOS님. 고래상어 소개 네이버 블로그. Web. December 10 2012. ↑ R. Aidan Martin. A review of behavioural ecology of whale sharks (Rhincodon typus) ScienceDirect. Web. November 10 2006. ↑ Jonathan D. Nelson. Foraging ecology of whale sharks (Rhincodon typus) within Bahía de Los Angeles, Baja California Norte, México ScienceDirect. Web. November 13 2006. This page was last modified on 1 May 2014, at 15:11.